On a busy, mild day for tennis that became increasingly windy toward the evening, the Wood River High School tennis team displayed its 4A power with a 10-2 nonconference dual meet triumph over the 3A Community School Cutthroats at Sun Valley Tennis Club. Wood River's boys prevailed 4-2, falling only in two boys' singles matches. The girls enjoyed a 6-0 sweep behind strong singles play by No. 1 Lily Richards, No. 2 Margaret Reutter and No. 3 Alex Feldman. The Cutthroats, a perennial 3A tennis power, couldn't penetrate the dominant Hailey doubles teams of Raleigh Grossbaum-Charlie Grabow, Josh Morell-Cole Caminiti, Sloan Storey-Erin Murphy, Tate Morell-Alex Taylor, Stephen Pfeiffer-Hannah Baybutt and Quentin Dowdle-Haley Cutler. In the other two dual meets of the three played Tuesday at Sun Valley, Wood River blanked Great Basin Conference league opponent Burley 12-0 and the Community School mastered Burley 10-2. Sweeping singles in straight sets for the Cutthroats were Michael Weaver, Willis Sanchez-duPont, George Everitt, Chloe Chrysikopoulos, Chloe Francois and Sara Runkel. 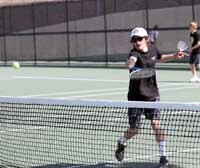 Coach Chris Gripkey's Sun Valley team also swept boys' doubles and mixed doubles, all matches in straight sets. Earlier Tuesday, coach Vicki Johnston's Wood River squad didn't lose a set in piling up a 12-0 league victory over Burley. The outcome improved the Wolverine dual meet record to 11-3, and 8-0 in league. Singles winners against Burley were Karl Wilander, Chase Hutchinson, Andrew Graves, Richards, Reutter and Feldman. The same doubles teams that won against the Cutthroats also won against Burley, except Audrey Brassil teamed with Alex Taylor for the No. 2 girls' win by 7-5, 6-2 scores. And on Wednesday, the Cutthroats continued a busy week with a 9-3 home league triumph (5-1 boys and 4-2 girls) over the Gooding Senators. Boys' singles winners for Sun Valley were Michael Weaver, Timo Gould and Nick Wright, all in straight sets. No. 2 boys' doubles Zach Lindahl-Gunnar Ohlson won 6-4, 6-3. The Cutthroats swept girls' and mixed doubles, all in straight sets, featuring No. 1s Chloe Chrysikopoulos-Jolie Blair and Reed Roudabush-Jolie Blair, and No. 2s Chloe Francois-Sara Runkel and Ethan Kjesbo-Ella Marks. Wood River travels to the Capital Invitational tournament in Boise today, Friday and Saturday, April 27-28 and then wraps up its league slate at Minico Tuesday, May 1 and home against Jerome for "Senior Day" on Thursday, May 3. The Community School hosts Sugar-Salem Tuesday, May 1 at 3:30 p.m. after traveling to Sugar City Saturday. Boys' singles: 1—Karl Wilander (WR) 6-2, 6-0 over Michael Weaver (CS). 2—Willis Sanchez-duPont (CS) 6-1, 6-2 over Chase Hutchinson (WR). 3—George Everitt (CS) 6-0, 6-0 over Michael Niedrich (WR). Girls' singles: 1—Lily Richards (WR) 6-0, 6-1 over Chloe Chrysikopoulos (CS). 2—Margaret Reutter (WR) 6-0, 6-0 over Chloe Francois (CS). 3—Alex Feldman (WR) 6-0, 6-0 over Sara Runkel (CS). Boys' doubles: 1—Raleigh Grossbaum-Charlie Grabow (WR) 6-2, 6-1 over Gunnar Ohlson-Zach Lindahl (CS). 2—Josh Morell-Cole Caminiti (WR) 6-2, 6-0 over Trenor Gould-Doug DuFur (CS). Girls' doubles: 1—Sloan Storey-Erin Murphy (WR) 6-0, 6-2 over Sydney Hagenbuch-Jolie Blair (CS). 2—Tate Morell-Alex Taylor (WR) 8-2 over Taylor Figge-Marleigh Poulsen (CS). Mixed doubles: 1—Stephen Pfeiffer-Hannah Baybutt (WR) 6-2, 6-2 over Reed Roudabush-Morgan Jones (CS). 2—Quentin Dowdle-Haley Cutler (WR) 6-0, 6-1 over Ethan Kjesbo-Ella Marks (CS). Boys' singles: 1—Michael Weaver (CS) 6-1, 6-1 over Angel Anguiano (B). 2—Willis Sanchez-duPont (CS) 6-0, 6-1 over Brennor Downs (B). 3—George Everitt (CS) 6-0, 6-0 over Brandon McFarland (B). Girls' singles: 1—Chloe Chrysikopoulos (CS) 6-1, 6-2 over Hailey Masoner (B). 2—Chloe Francois (CS) 6-0, 6-1 over Briana Pope (B). 3—Sara Runkel (CS) 6-1, 6-2 over Sydney Taylor (B). Boys' doubles: 1—Gunnar Ohlson-Zach Lindahl (CS) 6-0, 6-4 over Kord Carpenter-Brandon Bean (B). 2—Trenor Gould-Doug DuFur (CS) 7-6, 7-5 over Jaxon Greener-Brandon Hosteen (B). Girls' doubles: 1—Delta Jones-Kaci Carpenter (B) 6-1, 6-0 over Sydney Hagenbuch-Jolie Blair (CS). 2—Lexi Crane-Lauren Geary (B) 6-0, 5-7, 6-3 over Taylor Figge-Marleigh Poulsen (CS). Mixed doubles: 1—Reed Roudabush-Morgan Jones (CS) 6-1, 6-0 over Cody Milward-Rachel Weeks (B). 2—Ethan Kjesbo-Ella Marks (CS) 6-0, 6-0 over Emilio Marin-Brooklyn Geary (B).